The Solar Dynamics Hot Water System is built to last, with the most current technologies. 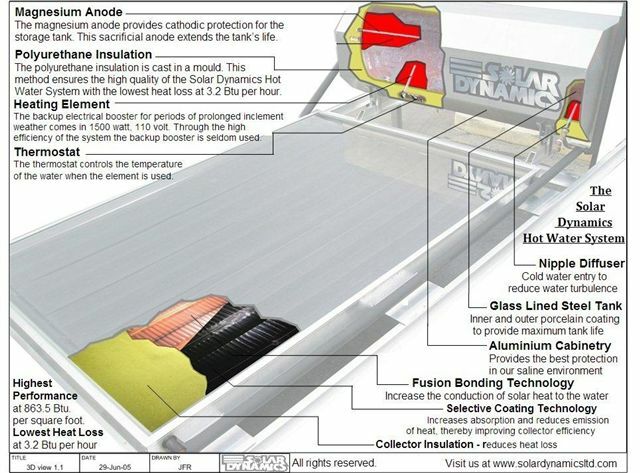 The solar energy passes through the safety tempered glass and is absorbed by the fusion bonded finned heat absorber plate which conducts the thermal energy of the sun to colder water in the tubes. By conduction, the heat is transferred from the plate to the water in the tubes. By convection, the heated water rises to the storage tank. This process continues throughout the day providing maximum hot water for use day or night. The heated water’s temperature is maintained by the polyurethane insulation. The inner tank is protected by a magnesium anodes which provides cathodic protection of the storage tank’s inner lining. The cabinetry of the storage tank is made of high quality aluminium cabinetry. All external components are of high quality aluminium including extruded aluminium for the collector housing. All components are chosen for long life in the saline conditions of the Caribbean and elsewhere. Designed for safe use, each collector is covered with Safety Tempered Glass. All aluminum cabinetry ensures the longest life in all weather conditions. Magnesium Anode provides cathodic protection to extend the life of the Solar Dynamics storage tank. 100% Polyurethane Insulation retains the maximum heat of the stored hot water for later use. Temperature Guarantee: Selective surface collector coating ensures the maximum heat absorption while reducing emissivity. The result is the delivery of the promised temperature by Solar Dynamics. Performance Guarantee: 5 year Pro-rated Guarantee: service at discounts ranging from 100% in year 1; 80% in year 2; 60% in year 3; 40% in year 4; and 20% in Year 5. There are two 50-gallon systems; one with 20 feet of collector, the other with 25 feet of collector. (Model 5020, Model 5025). There are two 80-gallon systems: Model 8033 with 33 feet of collector and Model 8042 with 42 feet of collector. Solar Dynamics sells six different models of hot water systems, based on gallon and size and square feet of collector. The design of and length of the tanks are the same; the diameter of each model is different. Download diagrams of plinth systems for 52 and 80 gallon systems here.